THEY'RE the images that should have every Sydney Kings supporter jumping out of their skin. 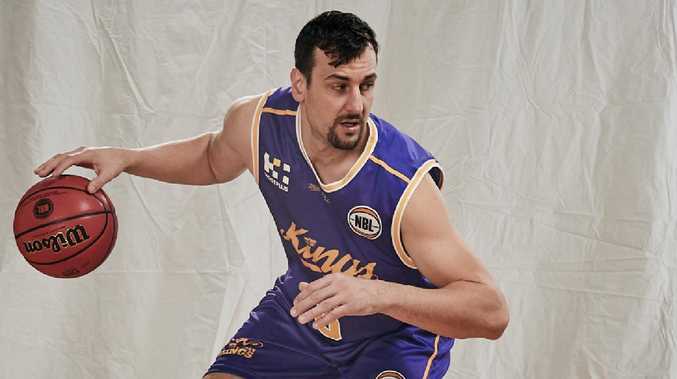 Andrew Bogut officially started life as a King during the week when he posed for pictures in the purple and gold uniform. The sight of Bogut pretending to post up and dunk is an exciting entree to his NBL debut with Sydney. The former NBA big man is still five months away from playing for the Kings but has already had a significant impact. Largely due to the Bogut factor, Sydney membership sales have surged in recent weeks. The Kings are already 75 per cent of the way to last season's total. This is a testament to Bogut's popularity, but also the strength of a roster that includes a raft of Australian representatives and two NBL most-valued players. Andrew Bogut is going to be the star attraction of the NBL. Kings officials will release the full membership results in the coming weeks. Bogut will attend the Next Gen Camp and the NBL Combine with Sydney coach Andrew Gaze in Melbourne on Monday and Tuesday. This will give the championship-winning Golden State centre the chance to view the next generation of basketball talent.